Shopping Cart (Credit/Debit Card or PayPal) - Ordering online with me is safe and secure! I use Sage Pay secure payment, the preferred choice of several High Street banks. Simply click on the Card option in Checkout to enter your card details securely. I accept all major credit cards. Please note that all prices include VAT at 20%. Telephone (Credit/Debit Card) - The second method of payment is to call us on 01367 253393 (open Monday to Friday between 10am - 6pm BST. If there is no answer, please leave your name and telephone number on the answer phone and I will call you back. All major credit/debit cards (including AMEX) are accepted and your card details will be processed and approved instantly. Again, your order will be processed immediately. We understand how difficult it can be to purchase from the internet and your satisfaction is very important to us. If you are not completely satisfied with your purchase (for whatever reason) you are entitled to cancel your order within 14 days of receipt of the goods. We request that all returns are received by us within 21 days of cancellation, unworn and with the label still attached. We recommend that all returns should be sent using an insured tracked delivery service. In some cases, and by prior written (email) agreement only, we may allow you to retain our products for a longer period. All items must be returned to us unworn and with the label still attached for us to issue a full refund under this special agreement also. All jewellery offered for sale on the Lilia Nash website, including necklaces, bracelets, earrings and rings, whether in stock or made to order may be returned for a refund. This does not include bespoke or personalised jewellery (see below). Before cancelling your order, please notify us via the contact form on this website or by telephone (01367 253393). We will send you full instructions on how to return the goods. Goods returned without prior notification may not be accepted. You are required to take reasonable care of the goods and should return them undamaged. Return postage costs are payable by the customer. All returned items should be carefully repackaged in the original jewellery box and packaging, and should be returned using a tracked and insured system of postage such as Royal Mail Special Delivery. We cannot be responsible for items that are lost in the post. Please allow up to 30 days for your refund to be processed. Sale items may be returned for a refund. You must notify us within 7 days of receipt of the item if you wish to return a sale item. After this time, I'm afraid we can no longer accept the item/s back for a refund or exchange. Cannot be refunded or exchanged as these pieces are made to the customer's own specifications or personalised with specific stones or engraving, unless faulty or mis-described. These are items that the customer has requested a different gemstone or design to those offered for sale on the website, or an alteration to the standard design, such as a longer or shorter chain. It also includes personalised jewellery such as text engraving and birthstone necklaces and bracelets, personalised with more than one pendant. Please ensure that you provide the correct ring size before ordering, as many rings cannot be resized. We reserve the right to refuse to refund for any item that has been custom made and where the correct size has not been given. We will always do our best to help however, therefore if there is a problem please contact us. All of Lilia’s jewellery is handmade to the highest standard. However, small imperfections should be expected and indeed these add to the uniqueness and charm of each piece. Your jewellery is guaranteed for 12 months after purchase. Each piece is carefully inspected during manufacturing and at the time of dispatch, however in the unlikely event that the item is faulty please return the item to us. We will examine the piece and determine the fault and if a workmanship is found we will offer a refund, exchange or repair, depending on the fault. Please note that this does not include normal wear and tear, neglect or accidental damage. If you would like to place a wholesale order for Lilia Nash Jewellery, please contact me to discuss your requirements. My wholesale policy is flexible and can easily be adjusted to suit your needs. Please note that all transactions made via this website are subject to UK law. Your statutory rights are not affected. By placing an order with Lilia Nash Jewellery you agree to the terms and conditions stated on this website. Please note that ALL text, designs and images featured on this website are protected by UK and International copyright law and are registered with the UK Copyright Service. I am able to detect copied material and will take action against those who break the law. If we should receive a complaint about any part of our service, by e-mail or letter, then it will be dealt with promptly (we will reply within 5 working days). Your complaint will be dealt with confidentially and effectively. Lilia Nash, Kestrel House Shop, High Street, Lechlade-on-Thames, Gloucestershire GL7 3AE. United Kingdom. 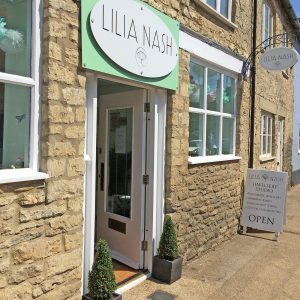 Lilia Nash Jewellery Ltd, Paradise Farm, High Street, Kempsford, Fairford, Gloucestershire GL7 4EU. United Kingdom.